Double box bed, coushined white leatherite back gives comfort support while reading or watching Tv, made of teak wood, melamine polished, hydraulic lift boxes, made from fine quality teak wood, melamine polished. 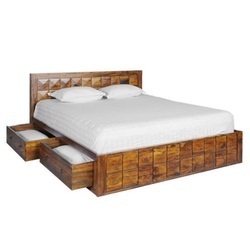 Box type king size bed Handmade and artistic Handcarved with "Raised tree of life carving" A unique design with unique look. We offer made to order facility for the people who would like to make things to their size and ever their designs too. Here at Xena Design we have a fantastic selection of Storage Beds that can really help add that extra storage space to your bedroom. If you’re struggling to find room for shoes, clothes or pretty much anything else and the room is starting to look a little messy, then a storage bed might be just what you need. 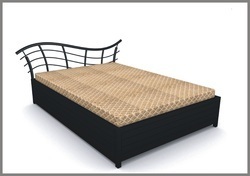 We are among the most trusted companies for providing Designer Cot to the clients. This product is hugely used in homes, resorts, hotels, and villas for high comfort level. Offered range is available with us in various sizes, dimensions and finishes, in accordance with the specific demands of our customers. We are one of the trusted companies of Commercial and residential furniture. Our products are enormously admired in the market owing to their top features.